Our commercial roof repair services are available to business owners and building managers in Innisfil. One of the most frustrating things to deal with as a commercial property owner is a leak in the roof. Walking into work only to find wet spots on the floors and damage to computers and other equipment due to a leaky roof can be a challenging problem to fix. It’s often tough to tell exactly where the roof damage is, making it harder to protect the valuable items within your office. Instead of putting your equipment at risk, give us a call at Slippery Slope Roofing for an assessment for commercial roof repair. We have over five decades of experience between our owner and foreman, so we can quickly find and repair problems without slowing down your company’s production. Dealing with a damaged roof can also cause your business to waste money on heating and cooling costs, since a lot of the warm and cool air can seep through the holes. You could also notice an increase in insects and spiders that come in through the damaged sections of the roof. Your building’s roof also helps to keep raccoons, squirrels, birds, and other wild animals out, so exposed sections could allow these furry and winged creatures to make homes within the interior of your office. Our commercial roof repair services are available to business owners and building managers in Innisfil, Ontario. Commercial roof repair is often more complicated than residential roof repair because of the size difference. 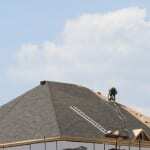 Don’t trust just anyone on top of your commercial building; rely on our team at Slippery Slope Roofing. At Slippery Slope Roofing, we offer high-quality commercial roof repair services in Innisfil, Barrie, Orillia, Bradford, Alliston, Newmarket, Midhurst, Cookstown, Beeton, Angus, Collingwood, Wasaga Beach, Oro-Medonte, Midland, New Tecumseth, Clearview, Bradford, Essa, Stayner, Springwater, and surrounding areas of Ontario.